"As a Bay Path University student, I will honor myself and my fellow students. In making this commitment, I will act with honesty, integrity, and respect and will take responsibility for my actions." Funded by the generosity of benefactor T. Marc Futter, the Program for Ethics in Leadership and Integrity in Action is a University-wide initiative, incorporated throughout the undergraduate curriculum. Based on the belief that ethics is reflected in both words and actions, the Program includes an intense ethics discussion for all incoming students at New Student Orientation, followed by the signing of the Honor Pledge at fall convocation and an ethics speaker in the spring. Ethical concepts are infused throughout the curriculum in all majors and examine the basic notions of “right” and “wrong” in contemporary society. Students develop and define their individual standards of ethical behavior relevant to their personal and professional lives. Our keynote speaker was Dr. Marialice B. F. X. Curran, founder and CEO of the Digital Citizenship Institute. 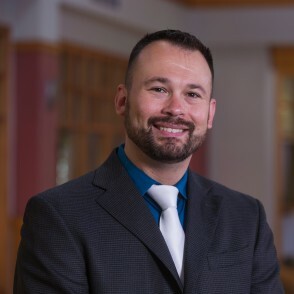 Dr. Curran has taught at the University of St. Joseph in West Hartford and been a middle school teacher, principal, and library media specialist. As a pioneer in digital citizenship, she developed and created the first 3-credit digital citizenship course for teachers in the United States. She co-founded the Digital Citizenship Summit and serves on the leadership team of the International Society for Technology in Education (ISTE). A reactor panel of one faculty/staff member (Peter Testori, Executive Director, Center for Online & Digital Learning) and one student (Leo Torres, Educational Technology tutor) applied Ms. Curran's remarks to a Bay Path context. A panel of three speakers who have firsthand experience in the local area working to improve access to fresh, nutritious, and affordable food in the city of Springfield and on issues of food justice in the surrounding area, addressed "The Ethics of Food:"
Elizabeth O'Gilvie - Chair, Springfield Food Policy Council. Through the SFPC and several other organizations, Liz is involved in a wide range of initiatives to improve access to high quality, culturally appropriate food for the people of Springfield, both through local community and school projects, and also through efforts to improve public policies which promote food justice. Neftali Duran leads the Nuestra Comida Project at Nuestras Raices, a grassroots urban agriculture organization based in Holyoke that creates healthy environments and more equitable food systems in New England by facilitating community leadership, education, food access and public policy change. Neftali’s work is informed by his own experience as a migrant worker from Oaxaca, Mexico and 18 years of experience in the U.S. restaurant industry as chef, baker, and small business owner. Sarah Bankert has worked in the field of public health for the past 10 years to create healthier communities by supporting community-led processes for change. She currently manages Healthy Hampshire, a regional community health collaboration that works with municipal leaders to promote access to healthy foods and opportunities for physical activity in Hampshire County and the Hilltowns. A panel of three speakers from an agency which helps to resettle recent immigrants to the U.S., including many refugees from war zones around the world, in the local community, addressed "The Ethics of Immigration:"
Deirdre Griffin, J.D. - Deirdre earned her bachelor's degree in government from Bowdoin College and her law degree from Boston College. She practiced immigration law in Cambridge, and later spent five years as the Operations Manager for the Massachusetts State Trial Court Office of Interpreter Services. Deirdre moved to Springfield eight years ago to live with a community of Catholic Sisters, the Sisters of Saint Joseph, at The Gray House in Springfield's North End. She ran the food pantry and thrift store there for two years before joining Jewish Family Service (JFS) in Springfield as New American Program Director in January 2015. Nasra Ali earned her Bachelor's degree in Accounting in Somalia, and came to the United States to study computer science in New York City. She has worked in refugee resettlement for 14 years. She is a Caseworker with the JFS Resettlement and Community Support Programs, working with newly-arriving refugee families from Somalia. Mamoun (Marc) Dulaimy G'11 came to the United States as a refugee from Iraq. He has worked with JFS for 6 years. He is currently a Caseworker with the JFS Community Support Program, as well as the Coordinator of Cultural Orientation services and the Refugee School Impact program. Mamoun earned his Master's degree in Communications and Information Management from Bay Path University in 2011. Frances Crowe - Still going strong in her mid-90s, this legendary peace activist has lived and worked in Northampton for over half a century, where she ran a regional office for the Quaker-based American Friends Service Committee for many years, and recently published her memoir, Finding My Radical Soul. Rev. Sarah Pirtle, MEd. - Inspired by Frances Crowe to work for social change, this peace educator and musician based in Shelburne Falls has published 5 books and 9 CDs for adults and children, taught graduate education courses on social skills and music, and founded the Discovery Center for Peacebuilding in 1992 to provide school residencies. Alicen Roberts - Also inspired by volunteering with Frances Crowe as an undergraduate student, this 2012 graduate of Smith College and veteran of living and working at the intentional community Agape in Hardwick is now making a difference at Cooperative Metropolitan Ministries, "the greater Boston area's oldest interfaith social justice network." Spring 2014 - Protecting Your Privacy: What Can You Do? It is a 21st century paradox: there is more public access to Wi-Fi than ever before, yet each day we hear of new threats to online security. What is smart use of our smart phones? At this year’s lecture for the T. Marc Futter Ethics in Leadership and Integrity in Action program, Alan Boulanger logs on to that topic. He is an IT security consultant, author of the book, “The Smart Women’s Guide to Privacy Protection,” and an adjunct faculty member at Bay Path. The shootings in Newtown, CT, have sparked discussions and changes in school security and how it impacts a culture of learning where children are also expected to be safe and nurtured. What must we do to keep our schools safe? Who should be included in the discussion about school violence? How can we prevent violence? Theses questions and many others were explored during the program. On March 27, 2012, Rev. Irene Monroe, a lesbian theologian, scholar, writer and activist, returned to Bay Path College to speak with the community on “To Choose or Not to Choose: Exploring how a Personal and Collective Agency of Choice Ethically Impacts Schools, Self and Society". The community was presented with various case studies and asked to use their ethical decision making skills. Rev. Monroe is the former Coordinator of the African American Roundtable of the Center for Lesbian and Gay Studies in Religion and Ministry (CLGS) at the Pacific School of Religion. She currently is a Huffington Post blogger and as syndicated queer religion columnist, her writings appear in 43 states across the country and in the U.K. and in publications such as The Advocate, New England Bay Windows, Boston In Newsweekly, and The Witness. On March 22, 2011, Rev. Irene Monroe, a lesbian theologian, scholar, writer and activist, addressed the Bay Path College community on “Alliance Building: Talking and working across our varied identity politics”. Monroe discussed how everyone either is now, or has been, or will be at some time a target of social oppression or bullying. Working together, we can become allies, and take on the role as an ally for someone else. Rev. Monroe is the former Coordinator of the African American Roundtable of the Center for Lesbian and Gay Studies in Religion and Ministry (CLGS) at the Pacific School of Religion. She currently is a Huffington Post blogger and as syndicated queer religion columnist, her writings appear in 43 states across the country and in the U.K. and in publications such as The Advocate, New England Bay Windows, Boston In Newsweekly, and The Witness. The Innocence Project is a national litigation and public policy organization that works to exonerate wrongly imprisoned individuals. Mr. Saloom discussed the recent recommendations from the National Academy of Science on strengthening forensic science in the United States and the ethical implications of the recommendations. Ms. Shah spoke about her research supporting her most recent book, The Body Hunters: Testing Our World’s Poorest Patients on New Drugs. Ms. Shah discussed the various Food and Drug Administration regulations and how the pharmaceutical companies in the United States conduct drug trials and tests using impoverished individuals throughout the world. Dr. Wiczyk’s provocative talk challenged the students to consider criteria of age, anonymity, familiarity, family structure and relationship, fresh versus frozen embryos and genetics in third party reproduction. Rev. Toller, an ordained deacon in the Catholic Church, administers to clergy who have been removed from the ministry for violations of trust, including sexual abuse.